To spread the love of performing arts by providing professional dance and music instruction to children of all ages and skill level. Our culture is a combination of our staff, our dancers, our Directors, our facilities, and our customers. It is the studio environment, a "vibe", and a perception all wrapped into a general attitude. While we don't always get it perfect, we do strive to promote a positive, upbeat and supportive culture. Part of that promotion includes encouraging our customers to be proactively positive versus passively indifferent. To help further define our culture, we've broken it down into three main components: Vision, Attitude, and Conduct. It is our vision to contribute to the community by training dancers and musicians to have kind hearts, compassionate deeds, humble spirits, eager minds, respected skills, healthy bodies and strong relationships. We are what we do; how we act and react; how we communicate both verbally and non-verbally. Attitude is what frames and informs all of those things. With that in mind, we've crafted an ideal attitude for all Dimensions family members. The more consistent we are in our shared attitude, the stronger and better we are. We are proud of our skills, our studio, and our Dimensions family, but we are not prideful. We are confident in who we are, but not arrogant. We constantly strive to be a better version of ourselves, not thinking of ourselves as better than others. We encourage, we don't insult. We are ready to be helpful, and willing to accept critique. We keep our minds open because when we stop learning, we stop living. We don't seek out confrontation, but are always willing to defend our Dimensions family. We value communication, dedication, passion, discipline, respect, and friendship. We never intentionally damage or vandalize Dimensions property. We always treat other students, supporters and guests with respect and kindness. We stop gossip and negative "venting" with kind words and positive counterpoints. We keep our words and actions age appropriate; in other words, PG or less is a safe bet. Tuition is based on a 40 week minimum session (you might get more) from August through May. This means, some months you'll have fewer classes (e.g. December), and more classes other months. Tuition is paid monthly (on the 1st) at the same rate whether you start in August or January. The earlier you start, the more value you get out of tuition. We do not prorate for missed classes. We do not prorate for scheduled closures (holidays, typically); they are already factored into the session. Make-ups are offered for unscheduled closures/cancellations. We now combine the multiple-class discount and the sibling discount into one flat rate discount of $15/class. In both cases the highest tuition is full price and all others are discounted. Discounts apply to both the Music and Dance programs. Exampl: Isabella takes Piano for $119/month. She can then take Level 2 Ballet for $74/month as well ($89 - $15). Her little sister, Angela, can take Tiny Tots for $64/month ($79 - $15), and their baby brother can take Talls-n-Tots for $54/month ($69 - $15). Register early! The annual registration fee per student will increase throughout the year. This does not mean registering later is bad (we want you a part of our family whenever we can get you! ), it just means you will have to pay a little extra. A fee of $25 will be charged to your account for any late tuition payments, including declined payments. There is a 3-day grace period for auto-payments before this fee is charged. There are many perks for everyone who chooses our school. The primary perks represent the built-value you get for your tuition payments. Next, there are some added perks that are our way of rewarding your loyalty to the Dimensions family. The difference? Added perks don’t impact tuition pricing (if we didn't offer them, you’d still get great value out of your tuition). We believe primary perks are necessary to maximize the value of your tuition (as compared to what's offered by other studios). To put another way, let's use a familiar food metaphor. Let's say cake represents the service all studios offer their customers; including us. That means the primary perks are represented by the icing. Some studios are just selling the cake. It's OK if cake with no icing is your thing, but to us, cake isn't cake without icing. Some studio agree and give you icing too. That's why we come in and spread it on double thick with our primary perks. But what about the added perks? Well, that's like getting a whole other cake (with icing, of course), and some ice cream on the side, for no additional charge. Whether or not you accept the extra cake and ice cream (it is a lot, after all) doesn't change the cost of the first amazing cake with double thick icing. Make sense? Unlimited adult drop-in classes for one person (age 15 and up) per enrolled student on your account (maximum of two people designated for drop-in classes per account). Access to pre-registration in April (closed to the public) for the upcoming year with $0 registration fee; one day only. One professionally recorded/edited digital video of the End-of-Year show for all dancer participants. Charging station/study area for homework or remote working while waiting for class to start/end. Curriculum based classes (not a “wing it” atmosphere). CPR and First Aid certified staff. Special impact absorption sub-flooring to reduce fatigue and chances for injuries. Dedicated admin staff separate from instructors. Dedicated viewing areas for customers. Annual recitals for dance; twice per year recitals for music. In the early 2000's, studio director, Christy Kearney, began to notice something in the dance community. There were good after-school programs for dance (at that time she was a Director for one of the most successful after-school programs) and there were really good traditional studios in Albuquerque teaching from a more serious and exclusive approach (Christy actually received her childhood training from Fishback School of the Dance ˗ one of the pillars of the Southwest dance community). What was missing, at that time, was a studio serving everyone else. 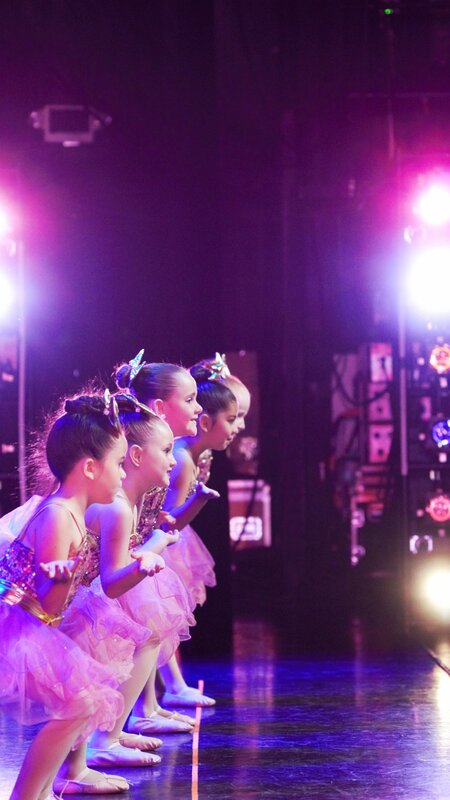 Christy believed there were kids interested in dance who wanted a professional studio experience, but not the pressure typically associated with that environment. On one hand, she saw recreational dancers and school team dancers who wanted more technique and foundation training. On the other hand, there were traditional dancers who were looking for more options to find their place as well as more enjoyment in general. To Christy, there was this wonderful middle-ground overlap between styles, talent, skill, body type, and goals that was sorely under-served. She was right, and the natural solution was to be the solution. In the first part of 2003, Christy (and her husband Brian), began to strategize. If this was going to happen, they would need a name, a basic curriculum, a building, and money. Then, after months of business planning and begging for startup capital from friends and family, Christy got important news from a colleague in the Cheer industry. A cheer gym was closing down operations and their space would soon be available. It was the perfect opportunity in a great location. After securing a lease, the hard work of converting a cheer gym into a dance studio began. Painting, filling in gymnastics pits, building out a viewing area for spectators, and laying a 2,500 square foot dance floor were just some of the tasks ahead. It took many all-nighters and, again, the amazing help of friends and family (this time with labor not money) to get the studio ready for business. At one point there were a dozen people, on hands and knees, at 1 in the morning, hammering nails into the refurbished subfloor to get it prepared for the Marley dance surface. It was exhausting and a bit stressful, but on June 3, 2003, Dance Dimensions (the original name of the studio) opened its doors for business. The 2003-2004 dance year was our first recital year. Recital was in May 2004 at Hope Christian High School Gymnasium. 2006 remodeled the main studio to have two rooms (versus one big one). 2006 we added our Music program! May 2006 our first recital at Popejoy Hall. 2007 remodeled the upstairs to have a small classroom. June 2007 we changed our name to Dimensions School of Dance & Music and updated the logo. August 2008 we officially added competitive cheer to our programs. June, 3, 2013 we celebrated our 10th year! August 2014 Christy, Bre, Stacey and Juliet became some of the first Booty Barre certified instructors in Albuquerque and our Adult Fitness program is launched! April 2015 we sold the Cheer gym which was purchased again a year later by Cheer Central ˗ if you're interest in Cheer, check them out. 2014-2016 we survived the 2-year Paseo/Jefferson/I-25 reconstruction! July 2016 Christy becomes the first certified POUND instructor in Albuquerque! August 2016 we shut down for 3 weeks to renovate the facilities into the beautiful studio you see today!